Well, it has been quite a week and if you can't toot your own trumpet on your birthday, then when can you? 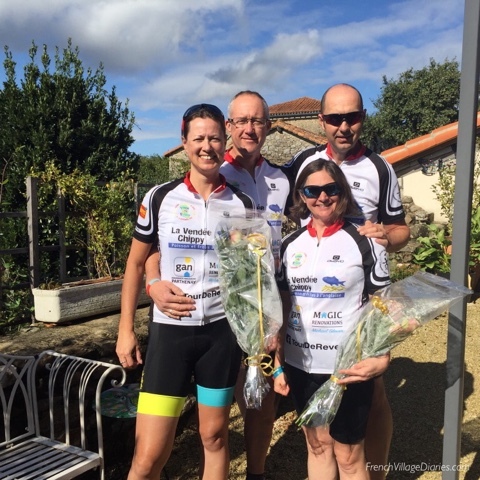 This time last week we were just finishing off our six-day cycling challenge that had seen us complete a figure of eight, 437km route around the Deux-Sèvres department of France. 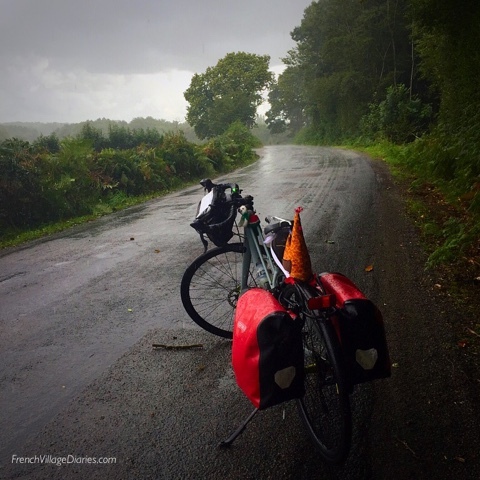 We had rain on four of the six days, head winds no matter what direction we were headed in, a bit of sunshine and with quite a bit of hill climbing it was certainly a challenge. However, it was also great fun thanks to the support we received, by the bucket load. If you would like to donate to the children's make a wish association Rêve, you can do so here, thank you. 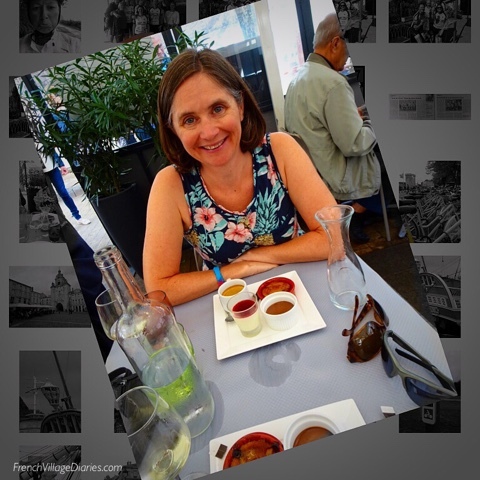 While we were away cycling Adrian's Mum was holding the fort at home (and by this I mean conquering my ironing mountain, among other things) and although sad to say goodbye to her on Tuesday, I was happy she chose to fly from La Rochelle as Adrian treated me to lunch, with a café gourmand dessert. I need a La Rochelle fix every now and then, just wandering around makes me feel a little tingly inside. It also felt quite indulgent starting my birthday celebrations four days early. 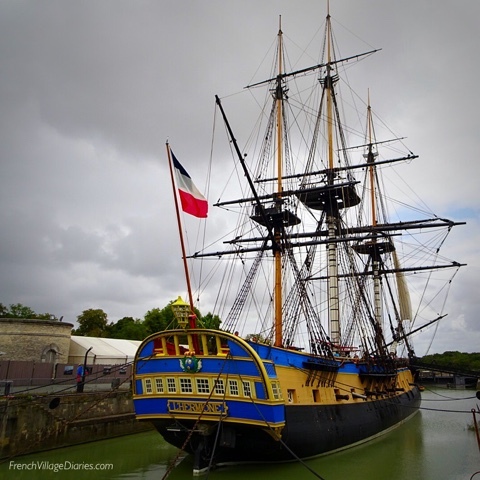 Not only did I get lunch in La Rochelle, I also got an afternoon in Rochefort where we saw L'Hermione, the replica of an 18th century French frigate (built to defeat the British) that was launched in 2015 when she sailed across the Atlantic to commemorate her predecessor's voyage to aid the American War of Independence in 1780. 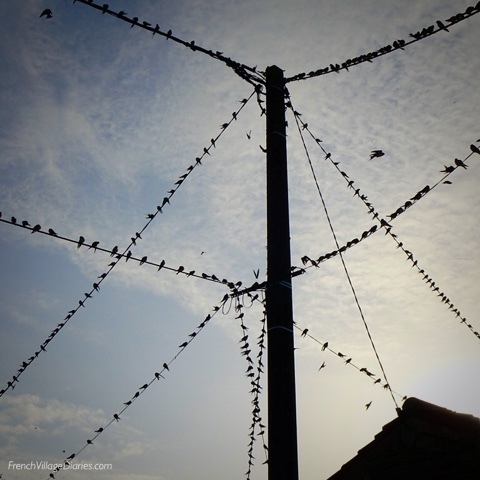 Nature has also put on quite a show for my birthday week, every morning the village has been decorated with hundreds of swallows, perched on the phone and power lines like bunting. It's always sad to see them go, but an incredible sight to see too. 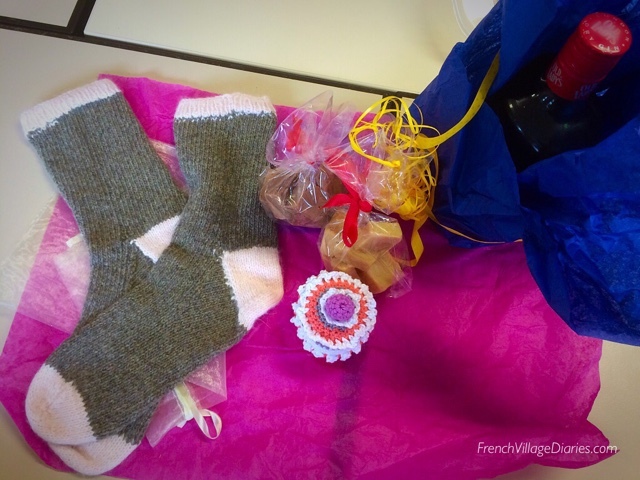 Friday was sewing club day and I was spoiled with handmade gifts including a zero calorie (crocheted) cupcake, some not so zero calorie homemade fudge, warm hand knitted socks and homemade walnut wine. 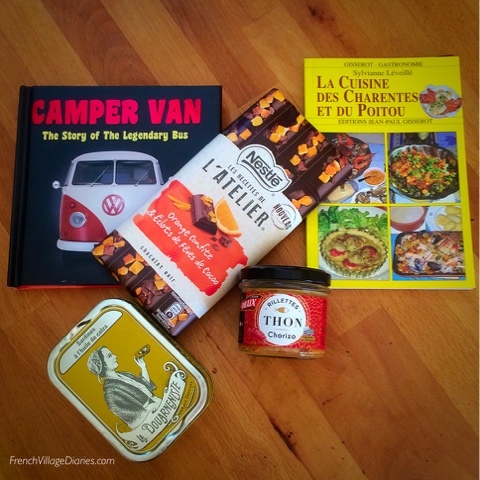 We have a tradition in our family - a birthday is not a birthday without some tinned fish and you might note most of my other gifts had a food theme too. 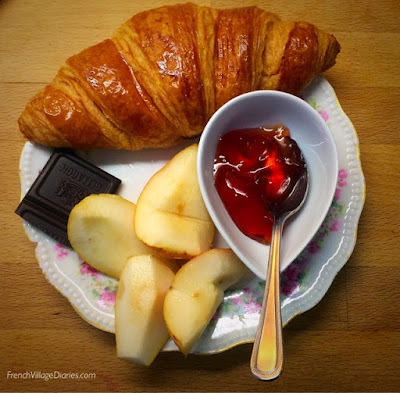 While we are talking about food, a croissant from the boulangerie, a pear from the orchard and some homemade quince jelly, served with a coffee and dark chocolate. This was the perfect start to my special day. 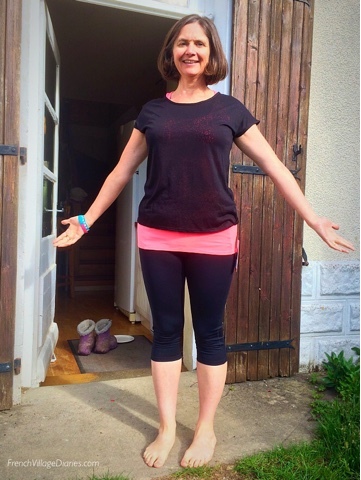 Those of you who knew me in my youth would probably not have thought exercise clothes or six day bike rides would form any part of my future, let alone feature at my 46th birthday. Well, if I'm honest, neither did I, but I'm glad they did. The rest of the day will also involve cycling, beer, Cremant d'Alsace (think Champagne) and homemade pizza - bring it on! Cheers! To your good health.